Trying to find out much about the Mercouri Estate is tricky as their website appears to be fully offline at the moment although their Twitter is up and running. This is a shame as this wine of theirs that I picked up while in Athens in the fall is simply wonderful, although disarmingly so. The name is a play on the Greek grape name, Mavrodaphne which is found in the Peloponnese region–a region that has some outstanding wines given what I tasted at several winemaker dinners including Skouras. When first opened, the wine is simply decent. Not offensive, not outstanding, but just a nice, Mediterranean red wine. Nothing wrong in that but as it decants, levels of complexity waft out and consume you. It’s a cheesy thing to say, but it does indeed transport the drinker to the region while they work through the bottle. I can’t wait to taste more of the wines from the Mercouri series in the future. 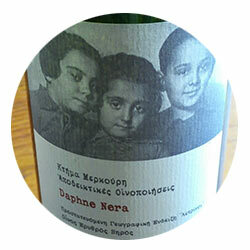 Red currant, fig leaves, very herbaceous, sandalwood, medium plus acidity, medium alcohol. Balanced in the mouth, carries the acidity very well, lingers forever and develops wonderful once opened.